The geckos have many different genus types, and each of the species has a special trait that make them unique. The gecko above is a leaf-tailed gecko. This unique animal has many different species with-in it genus Uroplatus. These specific geckos are native to Madagascar, where there are nine different species, which is the only place they are found. The subject Gecko at the Fort Worth Zoo is the Uroplatus fimbriatus, which is one of the largest geckos in the world. This large gecko is 5.6-7.6 inches long from snout to tail. This animal is amazing to look at in the zoo, he is so large that if you picked him up he would be able to use the underside of your arm as a resting place. Looking at this creature speaks for its self why people are amazed by its beauty. This gecko is much like others but it has some special traits: bark like skin, large eyes that can be yellow or a brown color, very flat, and his most special trait the leaf like tail. The skin on the animal is very rough looking and camouflages the gecko into the bark of a tree very well. The gecko sleeps all day and it accomplishes sleeping out of harms way, by blending into to a tree. The skin pattern on the jaw of the gecko helps to break up the patterns and look more like the bark of a tree. The Geckos have special traits as a species, they are nocturnal, they have no eyelids, they are the only Reptile who has been able to make use of their voice. They have special feet to hold onto vertical surfaces, their feet have two parts to attachment. First they have little claws at the tops of the toes to dig into the surface, as well as having adhesive structures bottom of the feet. *Recent studies of geckos have suggested that the ability of geckos to cling to a smooth surface is due to Van der Waal's forces -- numerous minute electrostatic attractions at the molecular level. Contact between the animals body and the surface it clings to is maximized by rows of scales on the toes divided into millions of microscopic plates. 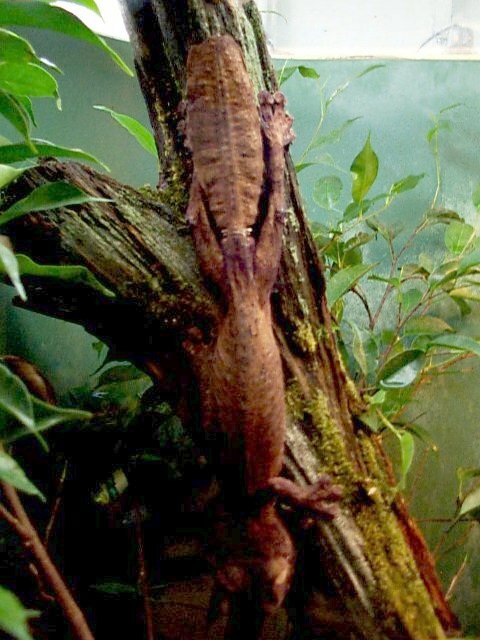 The Leaf -Tailed gecko has a unique attachment to its body compared to the rest of the geckos. His tail is large and flat, which appears to be of great help to the animal. 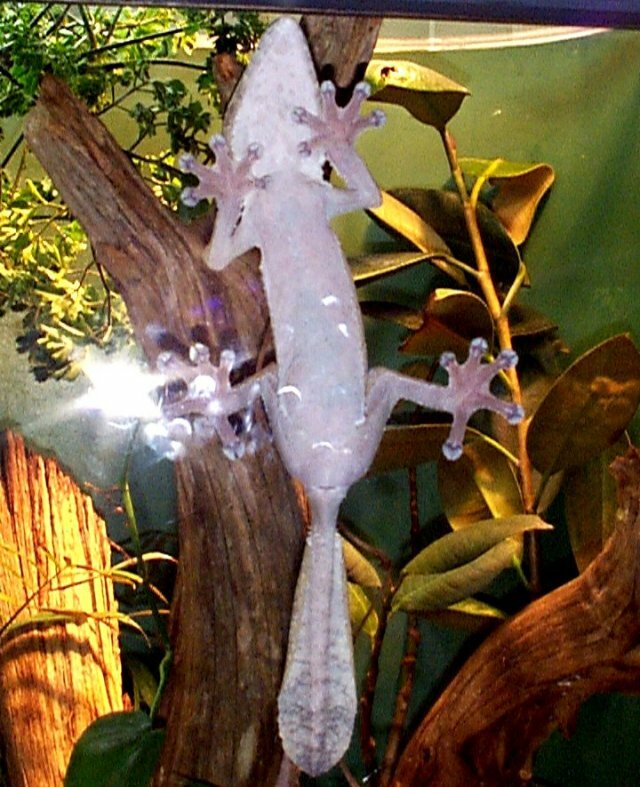 The gecko can use the tail to hold himself up on the branch of a tree, by wrapping the tail around the branch. This could be helpful to the animal when attacking a prey or reaching items of use to them. Or they can use it to just hang around and relax. Another interesting fact about this animal is the appearance of no eyelids. The reality of this is that their eyelids have become transparent. They have what has been said to be a contact lens type of fixture in place of the eyelid. When I went to observe this animal I found him to be very stationary, he was not very active and this made for a not so interesting attraction to the animal. However the animal was such an attractive looking animal because of its rarity. The animal does not remind me of what I think of when I describe a gecko, but I have learned there are more animal types than I first imagined. The tail is very fleshy and quite leaf like. The animal pulls the attention of the children because it's kind of odd looking, so the animal does get many visitors for it's unique look. Page Author:Ramona Crabtree, Animal Life Student. Texas Wesleyan University. Spring 1998. Source of information: Grzimek, Bernhard. Grzimek's Animal Life Encyclopedia. New York. Van Nostrand Reinhold Company. 1975. Pg.. 153 & 166. Spiess, Petra. Reptile and Amphibian Magazine. "Nature's Dead Leaves and Pez Dispensers: Genus Uroplatus (Flat-tailed geckos)". Found at the Rocky Mountain Herpetoculture Page.